I wanted to start this new year with a fresh new look on our card designs so i am pleased to introduce to you all my new designer to the Meiflower Crafts design team – Tracey. I met Tracey from the Trimcraft forum. I love her work, very quirky and unique. “My name is Tracey aka lalkygirl in blog land, I currently live in Pembrokeshire with my partner Tony, I work part time for the Red Cross in a charity shop. I have a stunningly beautiful [biased I know!!!!] daughter called Danielle who is 24. I have been crafting for about 3yrs now, I discovered the Trimcraft forum and that was me hooked!!! 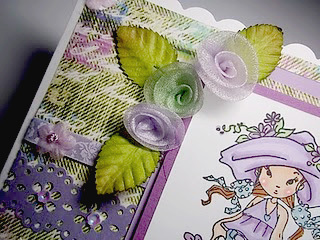 I love all papercrafting but my fave thing is cardmaking. My first love is rubber stamping and using my promarkers. I also love beautiful embellishments and using digi images and cd’s”. I absolutely adore the way Tracey has used the lilac organza ribbon on this design and the way she stuck the organza flower on the centre of the bow. This is such a pretty way of grouping the organza flowers together and adding some artificial flowers. It gives the card that extra special look! 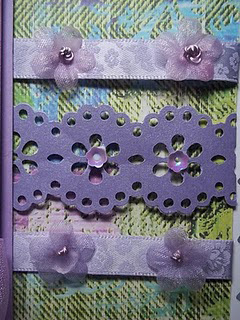 So pretty, I love the way Tracey has used the punch to create the lace effect and used the lilac blossom flower sequins to enhance the design. 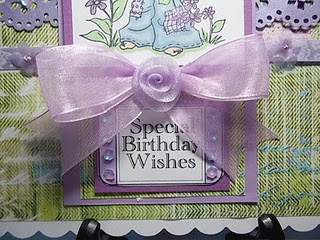 The lilac floral ribbon goes really well with this design. This entry was posted on Monday, February 14th, 2011 at 6:44 pm	and is filed under Design Team. You can follow any responses to this entry through the RSS 2.0 feed. You can leave a response, or trackback from your own site. Congratulations Tracey its a beautiful card as always, love your work you make such wonderful cards.